Needlepoint basketweave stitch is one of the most-used needlepoint stitches. 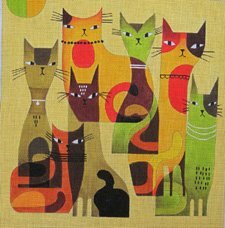 It is so-called because of the woven pattern it forms on the back of the canvas. 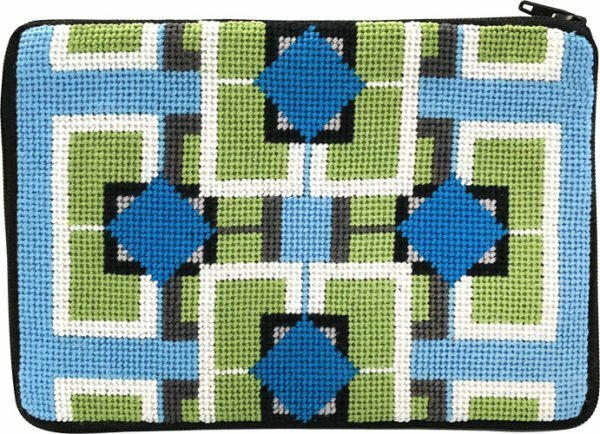 The basketweave pattern forms a strong stitch with good coverage and minimal distortion of the canvas. Needlepoint basketweave stitch is laid down in diagonal rows (rather than horizontal rows like needlepoint continental stitch). Start at the top right corner of the color area you are completing. top right hand corner of the color area and working in diagonal rows. Your needle comes up to the front of the canvas on all the odd numbers, and goes down to the back of the canvas on all the even numbers. Obviously, you would continue the number of stitches in each row for as long as you need to to get to the edge of the color area you are working. Needlepoint Basketweave Stitch - Why Use It? Needlepoint basketweave stitch gives good coverage of the canvas. It forms a woven pattern on the 'wrong side' of the canvas which gives it strength and durability. Needlepoint basketweave stitch distorts the canvas less than other stitches. You will still need to block your needlepoint canvas. The needle is always brought down through a hole that is occupied by a previous stitch (sometimes called a "dirty" hole), and brought up in an unoccupied, or "clean" hole. When you have to bring your needle up through a hole that is already occupied by a stitch, it is hard to avoid splitting or catching the stitch that is there. This inevitably means your stitches become raised, or look uneven. So, bringing your needle up in a 'clean' hole each time means neater, smoother stitches. 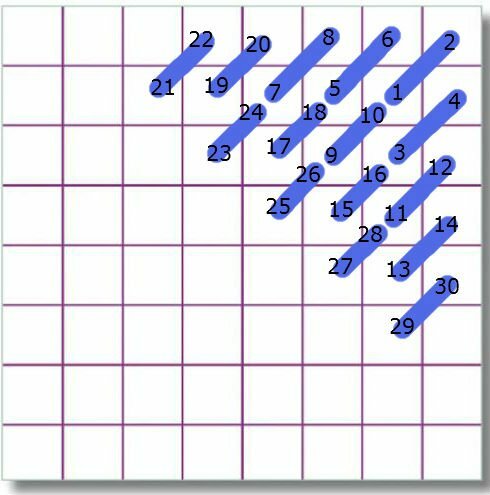 Needlepoint Basketweave Stitch - When To Use it. 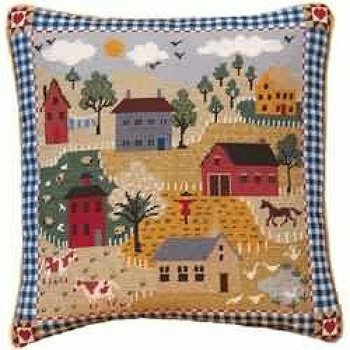 Use the needlepoint basketweave stitch for anything that is going to get some wear and tear - upholstery items, sofa pillows. On larger areas of color. If an area is very small or irregular then it might be hard to apply the the diagonal stitching pattern. If this is the case, switch to needlepoint continental stitch for these areas, but otherwise, needlepoint basketweave is the stitch of choice for good coverage and smooth stitching. When you are using a continuous motion stitch. If you are not using a frame (you cannot get enough "bend" in the canvas if your work is on a frame) then needlepoint basketweave stitch works well with a continuous motion stitch because the stitches still come out even. 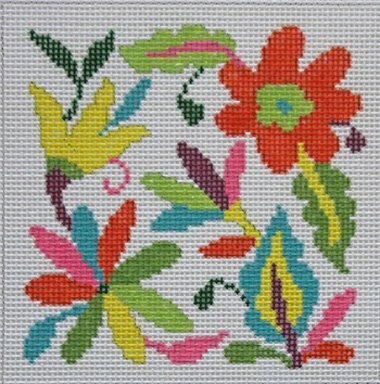 Using a continuous motion stitch with needlepoint continental stitch can create an uneven tension on the stitch. Needlepoint Basketweave Stitch - What Can Go Wrong? If a diagonal line forms in your work i.e. you can see how you have worked the rows diagonally, then it is probably because your needlepoint basketweave stitch got out of pattern. When you finish off a thread, start the new thread in exactly the same place as you finished. Let's say you finish a thread at the end of a diagonal row at the top of your needlepoint. If you start the next thread at the bottom of the diagonal row (instead of where you finished off at the top of the row), then this will form two horizontal lines next to each other on the back of the canvas. So instead of a needlepoint basketweave stitch pattern forming on the back you have a horizontal pattern and this will show up on the front of your work as a slight line in the stitching. Here is another reason why lines might form in your needlepoint basketweave. You see a lump or a line on the 'right' side of the canvas - this can occur if you slide the tail of a beginning or ending thread under the back of some stitches in a diagonal direction. To avoid this, slide the thread under the back stitches in a horizontal or vertical direction to secure it . Your thread length is too long. The thread will wear down as you pull it multiple times through the canvas. A long thread will be thinner on the canvas in the area where it finishes. So, when you go to start the next thread piece, you line up a nice plump piece of thread next door to the thinned out piece, and this forms a distortion in the stitches on the front. 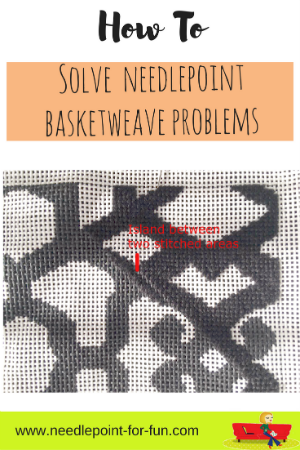 Here are some other problems you might encounter with needlepoint basketweave with some suggested solutions to try. There is a saying in needlepoint - "stitch up the steps and down the poles" and it ensures your basketweave stitches look nice and even. Learn how to do this here. Once you've been doing Basketweave for awhile you might get some questions about how to work it in irregular spaces. We have a great article about this. other tips and information on basketweave and stitching in general. NB: We are a participant in the Amazon Services LLC Associates Program, an affiliate advertising program designed to provide a means for us to earn fees by linking to Amazon.com and affiliated sites. We only recommend products we have used and can genuinely vouch for. We are providing this link for your convenience and we advise you to shop around. And, as always, you can contact us with questions about needlepoint basketweave stitch.